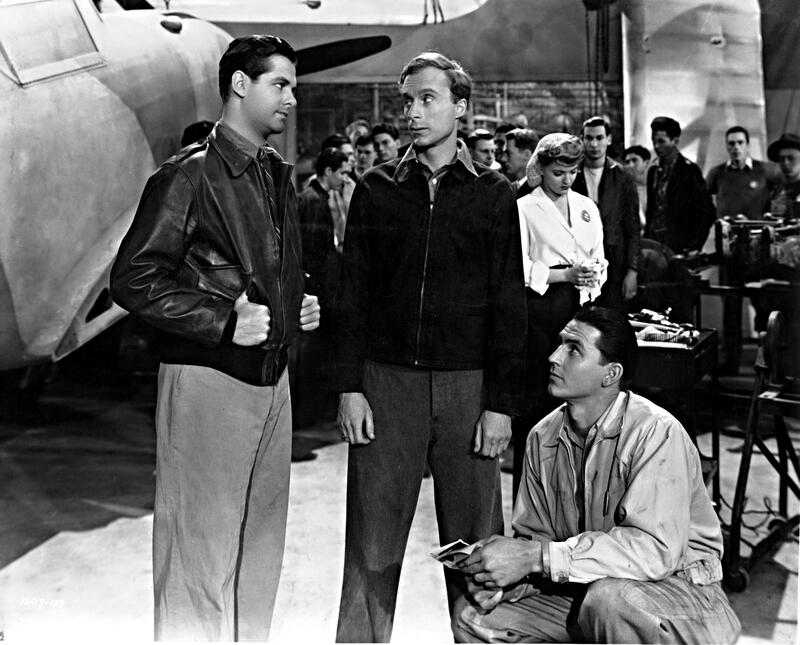 Barry Kane (Cummings) is an aircraft factory worker during WWII in Glendale, California (right next to LA). One day, he and his buddy get into a little argument with a strange guy at the factory. Not long after, a huge fire breaks out. When Barry and his friend go to stop the flames, the stranger hands Barry a fire extinguisher that Barry in turn passes to his friend. The extinguisher unfortunately does the opposite of extinguish. Someone had filled it with gas, and it ends up feeding the fire and killing Barry’s friend. Barry immediately suspects the strange fellow. He tells the investigators to look out for him, but finding zero trace of the guy the investigators decide to turn their attention to Barry himself. Soon Barry finds himself on the run throughout California, on the hunt for a man named Fry and a town called Soda City. After barely escaping arrest, he receives help from a blind old man who tells his skeptic granddaughter, Patricia (Lane), to take Barry to a blacksmith to have is handcuffs removed. Patricia is not as hot to help wanted fugitives as her grandfather is, so she plans to turn Barry in. Somewhere along the line a traveling freak show changes her mind (seriously), and they become partners in non-crime, set to clear Barry’s name. They find themselves in tight spot after tight spot, and eventually end up in New York City. 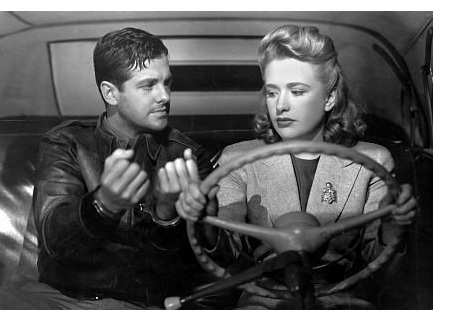 This movie, having come right when America was really getting involved in WWII, is very conscious of the minds of its audience. Barry is a good man and a good American contributing to the cause by working in a factory that builds planes for the army, and he is wrongly accused of a crime committed by traitors who are aiding in taking down the country from the inside with the notion that they will take over power when America is finally at its knees. In a grander view, Barry is America to viewers, and the saboteurs are Japan and the Axis powers. I say Japan specifically because of Pearl Harbor, but with secret agents and spies, the domestic threat could have come from anywhere. 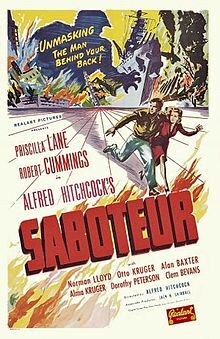 There is a lot of rhetoric about being a good American in Saboteur. A good American couldn’t possibly do such an act of sabotage against his or her own country. The fact that there are many Americans who either hate this country or want to burn it to the ground in exchange for power is hard for the characters to understand, especially Patricia. This to me is a bit of a comment on pre-WWII ideals versus how those ideals about America and its place in the world changed after the start of the war and America’s involvement in it. WWII was a loss of innocence (at the very least) for so many people and for the world itself. In the end of Saboteur, Barry’s pursuit of Fry brings him and Patricia to the Statue of Liberty. 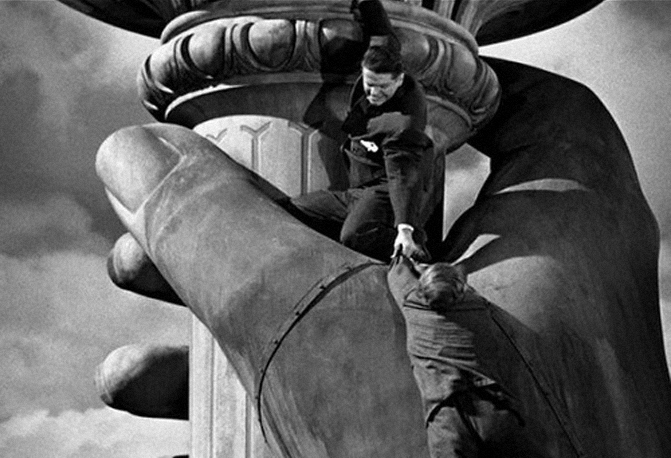 The final action scene features Barry clinging to Fry as Fry dangles off of the statue. Barry tries his hardest to save Fry, but his jacket rips, and since Barry doesn’t seem to believe in grabbing onto actual hands but only jacket sleeves, Fry falls to his death at the feet of Lady Liberty. Talk about a heavy statement. I really liked this movie, but mostly for Robert Cummings. He has a sly energy that comes through in his acting and it usually increases my enjoyment of a film by quite a lot if he’s in it. The formula, as I said, has been used again and again, and while I will admit I was a bit tired of it, I still had fun watching it. As the most recent Mission Impossible film makes clear, it’s a formula that always works. 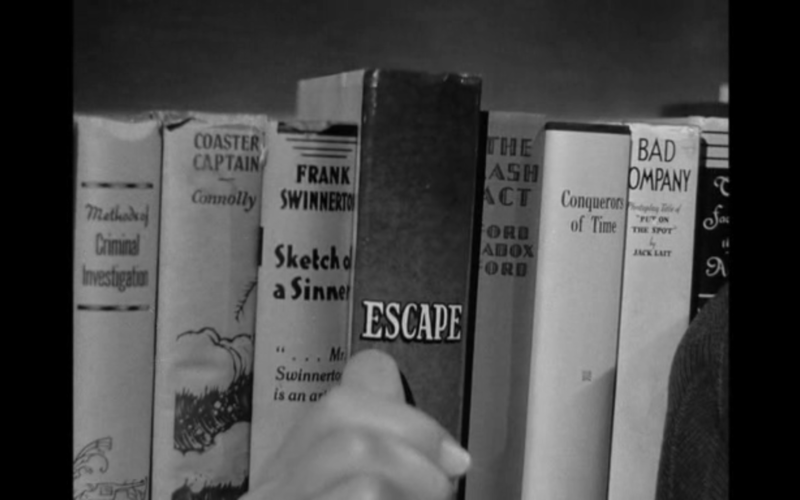 A fun detail about Saboteur is that is was cowritten by Dorothy Parker, who is kind of a badass. I don’t think this is Hitchcock’s best man-on-the-run tale, nor do I think it’s in my top-five, but it’s a very good time and worth a watch for sure!